Planning a vacation is stressful, and it can get even more complicated if you’re unfamiliar with the weather in your destination. However, 30A is made for relaxation and serenity. We don’t want you struggling to find information when we can use our local knowledge to help you! Read on to learn about Blue Mountain Beach weather, which season is best to visit, and make your dream getaway a reality in a stress-free way! Discover more helpful recommendations in our free Vacation Guide. 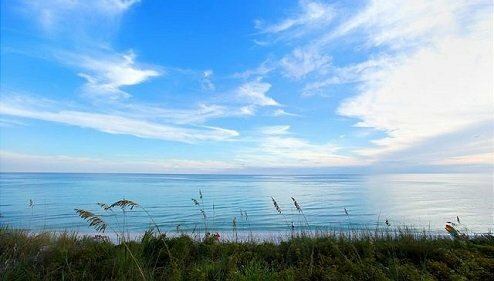 It features some of our favorite 30A restaurants, events, shops, outdoor activities, and more. Want to Know the Best Time to Plan Your Trip to Blue Mountain Beach? Check the Weather! Spring is a wonderful time to visit Blue Mountain Beach. Between March and June, you can expect average highs between 75 and 85, with the lowest being 54. Pack light sweaters for the wind, Tee-shirts, jeans and dresses, and a pair of closed-toe shoes in case of rain. Spring is great for nature lovers. Indeed, Mountain Beach is surrounded by great natural wonders! Check out these three Florida State Parks for inspiration, and consider adding a lovely bike ride to your vacation (we know the best bike rentals in town)! You can also enjoy a day out on the water and go fishing. Florida gets hot in the summer, and Blue Mountain Beach is no exception. Prepare yourself for the mid to high 80s, with a low average of 75. It’s a great time to pack your favorite cotton T-shirts, shorts, dresses, and sandals! We still recommend bringing an umbrella and a light jacket for possible afternoon showers. Summer is the most crowded month of the year, but it also offers incredibly fun opportunities! You can lounge on the beach, get out on the water to try kayaking or paddleboarding, and attend fun festivals like the Gulf Coast Jam in August! The good thing about Blue Mountain Beach’s weather is that it allows you to make summer last longer without having to deal with the crowd. Choose a fall getaway and lounge in the sun undisturbed! Between September and November, temperatures vary between the high 80s and low 70s. Pack sweaters and T-shirts (you never know! ), pants and shorts, and both sandals and closed-toe shoes. This season is definitely the trickiest; just remember that Florida is still very humid and hot when most states have switched to winter mode. Now’s a fabulous time to hit all the fun food festivals in 30A! The annual Baytowne Beer Festival is held every October, but if you prefer wine, plan your trip in November when the Harvest Wine and Food Festival is happening. Going on vacation off-season has its share of benefits, especially in Blue Mountain Beach. First, you pretty much have the place to yourself. Second, the temperatures are perfect if you’re not a fan of the heat! Anticipate temperatures between the low 70s and low 60s. You can pack sweaters, pants, closed-toe shoes, jackets, scarves, and enjoy lovely walks along the beach in the crisp morning air! There are a lot of holiday celebrations happening in 30A in the winter, including magical events, like the Festival of Trees! You can also treat yourself to a New Year’s Eve by the beach. Rain or Shine, Stay at Adagio! 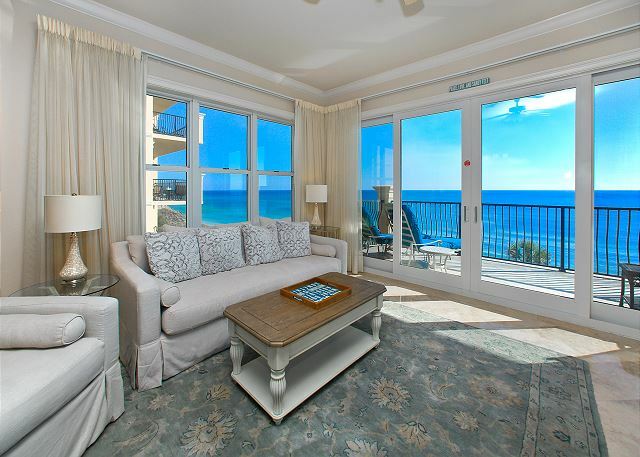 Enjoy the best views of 30A at Adagio! Our amazing properties all feature jaw-dropping views of the pool and Gulfside and offer a high-end experience for the entire family. Take a look at the Adagio C-301, for example. 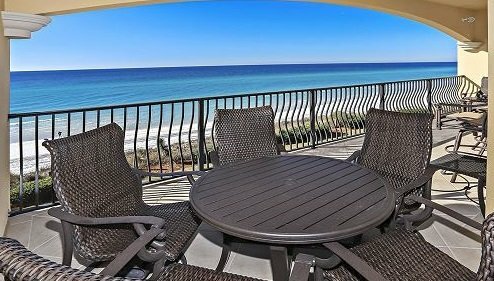 It’s an elegant and modern unit facing the Gulf, which offers spectacular views. Imagine yourself sipping on a cup of coffee while gazing at the waves on the horizon! Because a summer vacation is all about the memories you make, Adagio provides you with the best amenities possible to host your family getaway. This condo has four spacious bedrooms and three bathrooms, as well as a balcony to watch the sunset. You’ll love cooking dinner in the modern kitchen with granite countertops and stainless appliances. When you want to take a break from the beach and lay back near your condo, check out our pools! 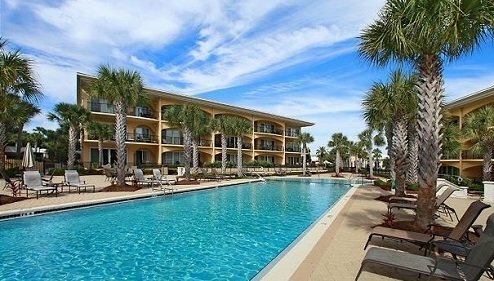 Our complex is equipped with a 1,700-square-foot, heated Gulf-side pool with an infinity edge overlooking the Emerald Coast, plus an 8,000-square-foot front pool with three tiers of fountains and waterfalls!